Right about now, ladies and gentleman, I humbly request time to speed up. I am finished being pregnant. My insides are in a war with my outsides. I am painfully aware that what arrives after pregnancy is not easier. I’m just ready for this hard thing to be over, and to move on to the next hard thing. I mean, I’m so slow at this point that it’s taken me a full week to write this blog post. 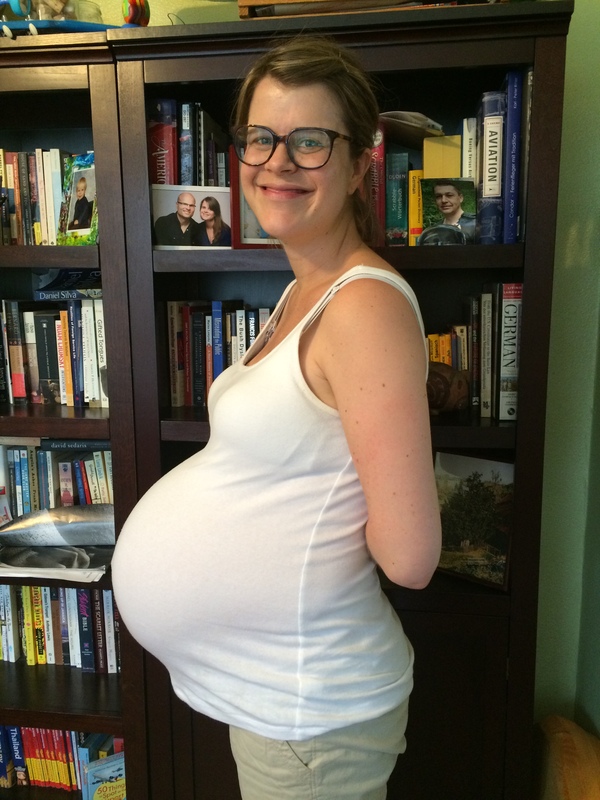 Tomorrow I will be 37 weeks into this glorious science experiment. If I don’t eat one of those free muffins in our work kitchen, someone else who isn’t growing another person will eat it, inefficiently meeting the caloric needs of 1 when it could be meeting the needs of 2; therefore, I must eat that muffin. Carrying 2 full cross-body bags from the garage in the alley up to the apartment while holding hands with a dawdling 3-year-old is physically challenging; so, despite all sound medical advice for the final month of pregnancy, it makes complete sense to pick up said 3-year-old for a block to speed up the walk. Although I feel like a whale, if I really WERE a whale, I’d be pregnant for more than 2 years; therefore, I must just be a human in the final weeks of gestation. If seated public transportation passengers looked up to see an expectant mother (or a child, or an elderly or disabled person) smashed into the aisle, it wouldn’t even occur to them to stand; therefore, ignorance is to blame and punching them each individually in the neck would be unhelpful. Since out of sight, out of mind is a universal truth, I no longer have to shave my legs. I mean, I have to go OUT OF MY WAY to see them = no longer my concern. Hey, and read this. It’s a good parenting reminder.